STG 1. BACA and Stacey Lannert | Survivor Team Go! 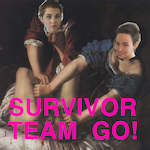 In the first episode of Survivor Team Go!, we shout out to Ryan who just got out of a relationship with his horribly abusive ex-boyfriend, cry about Bikers Against Child Abuse, and tell the story of Stacey Lannert, who was convicted of first degree murder for killing her sexually and physically abusive father.